This is my neighbor Kathy's recipe for fresh taco dip. 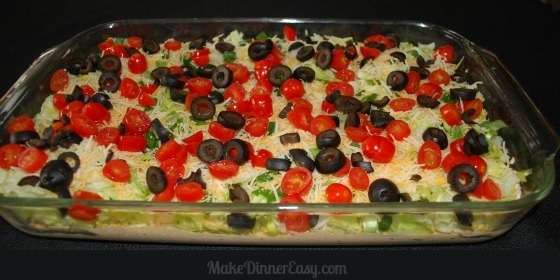 There are a lot of recipes for layered taco dips out there, but this one is my favorite. I'm usually not a big fan of iceberg lettuce, but it's crunchy texture makes it the best type of lettuce to use for this recipe. This is one of those recipes that I had to have after she made it for a party we were at. I was the obnoxious guest who stood by this dip until I was stuffed. 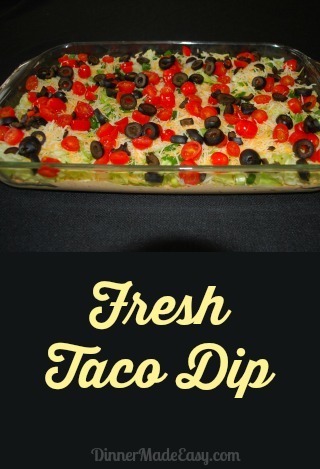 I like it because it has a lighter and fresher feel, with all the veggies, than a lot of other taco dips that I've tried! 1. Mix cream cheese, sour cream and taco seasoning mix. Spread this mixture on the bottom of a 12"x12" platter and chill for 3 hours. 2. Chop veggies and drain well, blotting on a paper towel if necessary. 3. Layer the veggies on top of the cream cheese mixture: first the lettuce, then the tomatoes, then the onions, then the olives, then the cheese.